Attorney General Jeff Sessions gave U.S. attorneys the green light Thursday to aggressively enforce federal laws against marijuana — even in states where pot is legal. In doing so, Sessions reversed an Obama administration policy that shielded legalized marijuana from federal intervention and enabled the pot industry to flourish. 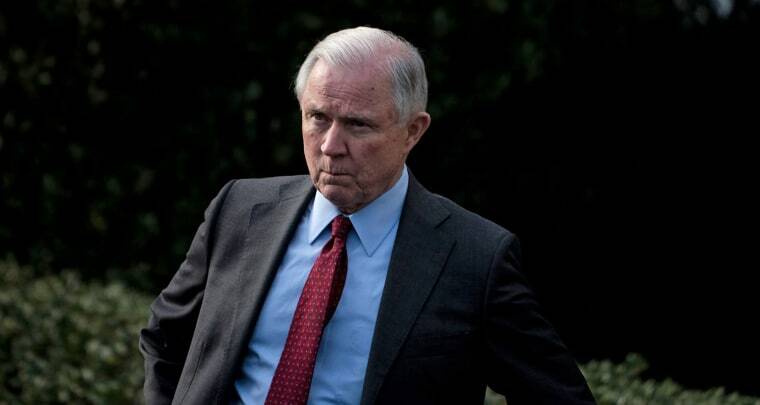 "The previous issuance of guidance undermines the rule of law and the ability of our local, state, tribal, and federal law enforcement partners to carry out this mission," Sessions wrote in a three paragraph memo. Sessions wrote that he is simply directing "all U.S. Attorneys to use previously established prosecutorial principles that provide them all the necessary tools to disrupt criminal organizations, tackle the growing drug crisis, and thwart violent crime across our country." Federal law prohibits growing, buying and using marijuana. But while Sessions gave permission to prosecute marijuana cases, a Justice Department official stressed that he did not explicitly call for that. Nor did Sessions say federal prosecutors should now go after the industry. Still, the Sessions memo drew immediate condemnation from Colorado Sen. Cory Gardner, a Republican whose state legalized pot in 2014. He threatened to retaliate by holding up confirmation of Sessions' picks for top DOJ positions. Colorado U.S. Attorney Bob Troyer said his office has "already been guided by these principles in marijuana prosecutions — focusing in particular on identifying and prosecuting those who create the greatest safety threats to our communities around the state." "We will, consistent with the Attorney General’s latest guidance, continue to take this approach in all of our work with our law enforcement partners throughout Colorado,” Troyer said in a statement. The previous Justice Department policy, which was laid out in a 2013 memo from the deputy attorney general at the time, James Cole, said federal prosecutions would focus on cases of peddling pot to minors, selling marijuana across state borders or growing pot on federal land, or when it involved gangs or organized crime. A senior Justice Department official said one reason for the change is that the previous policy "was perceived to have created a safe harbor for the industry to operate." The move by the nation's top law enforcement official comes the same week that California began selling recreational marijuana. It is also legal in Alaska, Maine, Massachusetts, Nevada, Oregon and Washington. There are also thriving medical marijuana programs in 28 states. The head of the Drug Policy Alliance said Sessions is defying the 64 percent of the American people who support marijuana legalization. Sessions has just shown "how out of touch he is with scientists and taxpayers" and that siccing federal prosecutors on pot offenders will just needlessly jam the jails with more prisoners, said Jasmine Taylor of Human Rights Watch. Amy Margolis of Greenspoon Marder, which has a cannabis practice, warned Sessions' order "sets up a serious potential battle between the states with legalization and United States attorneys who decide to enforce federal law against the will of the voters and, in some cases, state legislatures." Anti-marijuana activist Kevin Sabet, however, praised Sessions' order, calling it "a good day for public health." "The days of safe harbor for multi-million dollar pot investments are over," said Sabet, a former Obama Administration drug policy adviser who now heads Smart Approaches to Marijuana (SAM). "DOJ's move will slow down the rise of Big Marijuana and stop the massive infusion of money going to fund pot candies, cookies, ice creams, and other kid-friendly pot edibles. Investor, banker, funder beware." Sessions has long been a cannabis foe who famously said “good people don’t smoke marijuana” during a 2016 Senate hearing. He also was accused of telling late assistant U.S. Attorney Thomas Figures that he thought the KKK was "OK until I found out they smoked pot." This was after Sessions learned that Klan members had gotten high the night they kidnapped and murdered a young black man. Sessions insisted he was joking.